How do we teach our kids to determine right from wrong? 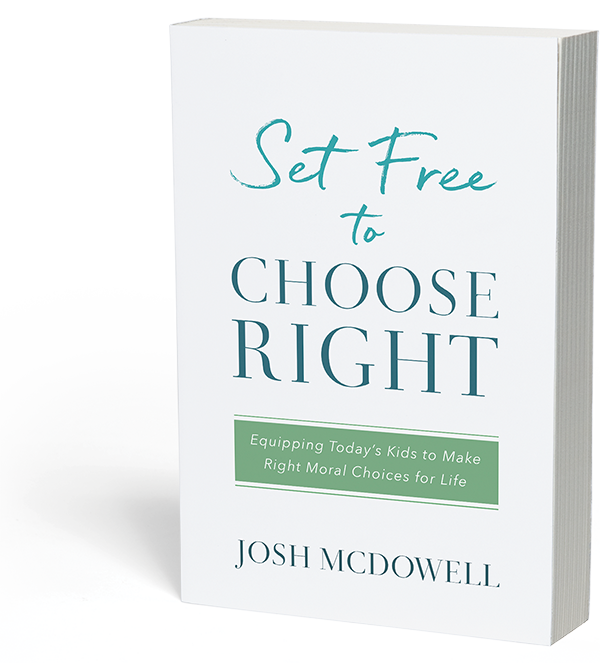 Directed to parents and gatekeepers of today’s youth, this brand-new work by renowned speaker and author, Josh McDowell, focuses on the how-to’s of teaching teens and pre-teens to make right moral choices. Engaging stories and helpful illustration are provided to model how a person (of any age) can distinguish between right and wrong and make the right choice--every time! Are You a Pastor? Josh McDowell offers pastors and church leaders a "Church Packet" with additional FREE RESOURCES. CLICK HERE to access your free packet. Why today’s kids feel they have the right to determine what is “right” or “wrong” for themselves. How culture reinforces that there are no universal truths and where this misconception historically originated. How to motivate kids to make good choices. What it is in God's character and nature that makes right, right and wrong, wrong. Do your kids know how to determine what is right and what is wrong? Download the FREE guide "How to Determine Right from Wrong" by Josh McDowell for some basic questions you can ask to test their knowledge. Plus, find helpful info about how to really make that determination for yourself and how to explain it. ​This is a MUST-READ for parents and gatekeepers of youth.